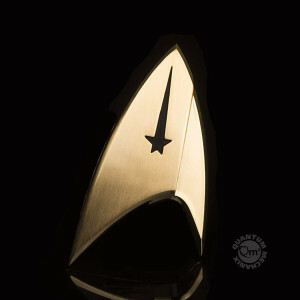 Hi I ordered the Star Trek Discovery Command Bagde it came on time, Its want I Expected. It came on time, I'm really happy with it. Perfect and heavier than I thought (which makes it seem more real, haha). Nice strong magnet! The badge you always wanted. Great quality, good weight, looks fantastic. Great!! The product looks fantastic. Strong magnetic clip on. Arrived quickly. Brought for my wife and she loves it. Great product! Nicely made, arrived quickly, and was exactly as described! Much heavier than I expected. Strong magnet. Looks good! I bought this as a gift so I haven't removed from the package. The badge looks great from what I can see, just like the online photos. Great condition and really beautiful. Just the packaging was damaged. Other than that, pretty great. Awesome Command Badge. Excellent made. Just love it. “The silver-tone medical insignia features a traditional cross displayed neatly in the center.” “Cross?” Do you think that Starfleet is a home for Christian missionaries? It’s an elongated STAR, you idiot. The design is amazing. Lightweight, has a strong magnet, and will finish out the set. I got the commander version this time. Love it! Magnet is the best I have seen on any other product. As with all the QMx badges, the Discovery badges are beautiful and top quality. The Discovery badges on the show in include the pips representing rank, which are missing from the QMx badges. Larger than the old badges, lovely contrast between satin and bright finish, two magnets to hold badge firmly, looks great and it's designed "logically". I got the Command badge.